The Montenegro ccTLD .ME is gaining in popularity thanks to its dual usage perfect for personalised services, campaign domains and social media projects. .ME domain seems to hold a great promise for the future. It is known that a measure of domain’s value is its utilisation by end-users for “full-fledged” projects. The value of it, which is not limited to mini-site or just parking of your domain, is demonstrated by offering valuable content or a specific service. Since 2008, Montenegro’s country code domain, .ME, has been making a lot of noise in the domain world. As one of the fastest growing European ccTLDs, .ME has become increasingly popular with companies such as Facebook (fb.me), Visa (v.me), WordPress (wp.me) and for personal blogs alike. However, it seems that it is most efficiently put to use by the start-ups who understand how to stand out from the competition – starting with the web address. 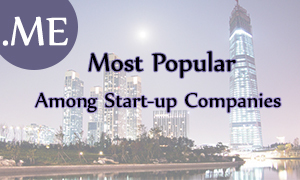 For the last five years, the .ME domain has been very popular among start-up companies. Last year, according to research conducted by Thomas Park, a graduate student from Philadelphia Drexel University, among 1,000 start-ups added to the CrunchBase database on TechCrunch 1.7 per cent. use the .ME domain, while only 1 per cent of the new start-ups use the .CO extension. Companies such as Shapify.me, offering the easiest way to scan oneself at home and get a 3D print of one’s figurine, Kiip.me, a mobile rewards and advertising company that raised over $15.3 million funding to date, or Glide.me, the finalist of 2013 TechCrunch Disrupt Start-up Battlefield, – all are making their virtual presence „Memorable” thanks to the .ME extension. Can this Montenegro TLD be the Internet’s rising star? To check if the .ME domain name that you desire is available, enter the name in the box. Web Solution’s Support Team is available to answer any questions your might have at support@web-solutions.eu or via phone on +44 (0) 208 133 3994.